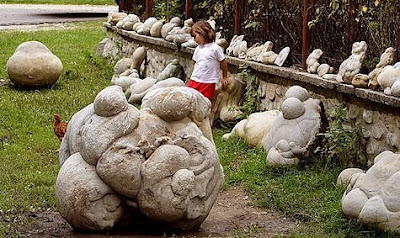 Each time it rains, some of the stones in central Romania display an unusual--some might say disturbing--behavior. Strange round swellings begin to appear all over them. Little by little, the nodules get bigger and bigger. Watch the stones long enough, and you'll realize . . . they're growing. Called trovants, the bizarre growing stones have been known to reach over thirty feet in height. How does it happen? Find out here. Those are some of the most interesting rocks I've ever heard of... Amazing. But I don't understand it. Then again, would it still be as amazing if I did...? thats cool!!! !my and my cousin and mom are having this very interstingly somewhat aggressive conversation qabout these and how they canh "grow". nevermind, everyone stopped talking and went back to their wii/computer/magazines. That's exactly what my science teacher said---last year. She was also my homeroom teacher. My friend was looking at the pictures and sort of describing what they looked like. For one of them she remarked "it looks like cow pie"
Wow. I thought only living things grew! Oh, and BTW, please visit my website @ gillia.piczo.com!